Roanoke Times, 3-29-11, Pg 5: Obama: Standardized tests used to ‘punish’. Students should take fewer tests, measure students other ways, don’t punish students or schools for failing performance. Find a test that “everyone agrees with”. Obama should reflect on the “United College Fund’s” advertising slogan”: “A Mind is a Terrible Thing to Waste”; instead of kowtowing to the teachers unions and the proponents of mediocrity he should be setting the standard for achievement and accomplishment. Apparently that’s not politically correct for a “community organizer” from Chicago. Apparently many of those who are responsible for student performance don’t want measurement and accountability. Let’s all just vote on who is mastering the basic courses that are essential to be a productive member of our society. “We don’t need no stinkin grades to decide who is teaching and who is learning”. And let’s not measure the schools or the teaching system. Let’s just keep spending $150,000 for each student for K12 and their part-time attendance. Apparently Obama wishes to eliminate these too, after all, these “standardized” tests are just used to “punish” and why would your Doctor ever need to pass a test anyway? Once again Obama is proving to be a huge disappointment and embarrassment to all the intelligent people who voted for and supported him. Talk about your break-down in the election “truth in advertising” process! However, the Editors of the Roanoke Times are in lock-step with Obama and associates and doing all they can to perpetuate his misdirection and wrong-headed policies. They consider this to be part of their public service activity. Tea-Partiers want the federal government cut, no matter the consequences and no matter how little it will impact the debt. Yet another Roanoke Times tirade lamenting the TeaParty and the Congressional Republican focus on getting the $1.5 TRILLION annual budget deficit under control so that we can then start to address the $14.5 TRILLION National debt that we owe, mostly to non-US entities who are not our friends. And that doesn’t count the indebtedness of our individuals, communities, states and authorities. Of course there’s scant impact on the deficit! How can there be impacts on the deficit until we have a yearly budget surplus to apply to our debt? If your family is running up ten thousand dollars of debt per month on top of one hundred thousand dollars of total existing debt, perhaps you should immediately make a budget to live within your income and cut-up your family’s credit cards and prioritize your spending. Shouldn’t the government do to same? “If we continue down on the path on which the fiscal authorities put us, we will become insolvent, the question is when,” said Dallas Federal Reserve Bank President Richard Fisher after a recent speech at the University of Frankfurt. This is a National Survival Issue! Pandering to the 50% of our people who don’t pay taxes may make good short-term politics but facing the reality of bankruptcy at the personal, local, state and national levels requires more than playing politics; it requires citizenship and leadership! What possible reasons do the Editors of the RT have for supporting those who are driving our country into bankruptcy? The RT Editors never print the impacts of the numbers in their articles such as the service (interest payments) on the debt. At 3% interest it is: $435 Billion per year. As interest rates rise with inflation to 5% it will be: $725 Billion per year. Since the Editors of the RT clearly were not math or economics majors, perhaps they should seek assistance on the magnitude and impacts of these interest payments on our people and economy; none of which pay down the principal (debt); it’s just money we don’t have going down a rat-hole. This is the Obama-Democrat Plan for Economic Recovery and Job Growth and a better future for our children that the RT Editors are supporting? How sad! Roanoke Times, 3-27-11, Pg 8: Budget Limbo spawns inefficiency, uncertainty “For 177 days now, the longest period in 14 years, the US government has operated without a budget” (because of those nasty tax-cutting Congressional Republicans)! NO THAT’S NOT IT! THERE WAS NO DEMOCRAT 2010 BUDGET! How about one year (2010)-(365 days) of the Obama, Pelosi, Reed No Federal Budget! What to do, what to do, let’s do nothing! Roanoke Times, 3-27-11, Pg Horiz 1 & 4: Obama took only path available to US in Mideast. Obama haunted by the legacy of the Iraq War. So unilateral US intervention in Libya was out of the question. NO THAT’S NOT IT! THERE WAS NO UNILATERAL ACTION IN IRAQ! So why aren’t articles of impeachment being brought before the US Congress by the President of the US Senate (Joe Biden)? JUST MORE GROSS HYPOCRISY FROM THE LIBERALS AND DEMOCRATS ! Obama launches a war upon Libya. Says he’s only going to kill people and break things for a few days. Hillary says NATO will take over the mission. NATO refuses to be in charge of killing people and breaking things. Some will help do that, but, demand that US be responsible! Hillary and Obama declare success! Except for the Bay of Pigs; has there ever been such chaos and disorder in the conduct of foreign policy in our Nation’s history! How can anyone deny that the team of Obama & Hillary look like preschoolers compared to Bush & Condoleezza! And to think that the liberal media told us that Obama was the smart choice. Just more hope and change we can believe in. USAToday, 3-18-11, Pg B1: Hunger, despair for millions; Food costs push many over brink. Corn has soared 52% in the past 12 months. For about 44 million people – roughly the population of NY, LA and Chicago areas combined – the rise in food prices means a descent into extreme poverty and hunger, according to the World Bank. It also increases our cost of living and impacts our economic recovery and job growth. Obama’s answer: increase burning corn (ethanol) in our vehicles from 10% to 15% as a sacrifice on the alter of Al Gore and this Global Warming Alarmists. Ever wonder why the world doesn't like us and thinks we're stupid? And Obama was supposed to be the smart choice. Iraq, Afghanistan, Pakistan & Now Libya ! Back on Page 5: Obama on political defensive over air assault. IT’S A WAR – STUPID! “This isn’t the way our system is supposed to work” Webb said on MSNBC. And not to be found in the RT was coverage of the first US F-15 down in Obama’s Libyan War. Roanoke Times, 3-21-11, Pg 3: Progress is being made against nuclear threat. The news media is awash with radiation stories. It’s a mass-hysteria vehicle that sells newspapers, jacks up ratings, promotes Hollywood movies and bolsters special interest individuals and groups all of whom prosper from the notoriety. However, the media is not highlighting that this is radiation from nuclear power material and not from weapons grade materials. Unfortunately we were not informed about nor protected from the major radiation threats from the multinational 500 nuclear weapons air-bursts from 1945 through 1970. This radiation from weapons-grade materials were released into the air from both fission and fusion bombs. The radiation swept across the US from West to East falling out across the entire country. The US government had a secret funded program of paying dairy farmers to dump contaminated milk. The timing, extent and success of this program is still not publicly available and appeared to be too little too late. Milk was important for two reasons: cows were an accumulator of radiation falling on grasses and grains and milk is a main food source for young people. Another important accumulator was tobacco. The large leaves collected fallout materials where it was adsorbed by the leaves and then processed into products that are inhaled directly into the lungs where the fallout materials were retained and accumulated in the tars in the lungs. Other problems were related to radioactive iodine entering the food chain and resulting primarily but not limited to thyroid illness. The pandemics of breast and uterine and prostate cancers in the US continue to be listed as “cause unknown” however, as the people who grew-up from 1945 to 1970 die-off hopefully these cancer rates will greatly diminish for those who followed. Not one word of concern or dissent or doubt about what Obama is doing! A despot is killing his people and threatening his neighbors. UN resolutions say stop! The US launches attacks. Bush is attacked and vilified and charged with human rights abuses and violating The Constitution by Liberals & Democrats and the Liberal-Media. Obama launches 120 cruise missiles onto Libya and is praised for his leadership and humanity by Liberals & Democrats and the Liberal-Media smiles from the sidelines. Where’s the outrage and indignation? Where’s the collateral body count of women and children? Where’s the Congressional vote to go to war? Where’s the War Powers Act? Where are Cindy Sheehan and her Democrat political fellow travelers? Where are the scathing Roanoke Times editorials of righteous indignation touting that war is never the answer? The hypocrisy of Obama, his associates and the liberal media is beyond comprehension. Obama has literally abandoned the Iraq War with no clear exit criteria, he has massively expanded the Afghanistan War with no clear mission accomplished criteria, he has expanded the Afghan War into Pakistan and now he has launched us into a Libyan War with no clear objectives other than raining down hell and damnation from the skies upon yet another Muslim Country. We are now at war in four Muslim dominated countries in the Middle East and Obama and friends think GITMO is the major focal point for Muslim hatred of the US. If we just closed GITMO the Radical Muslims wouldn’t be able to get any new recruits! And how does one differentiate between an armed insurrection in an internal conflict in Libya from what we have been defining as enemy combatants and terrorists trying to seize control of their country? Who are the terrorists and who are the freedom fighters? How many of the combatants in Libya are parts of the Radical Muslim Brotherhood or are surrogates for Iran or Hezbollah or Al-Qaida? Obama’s not using war as a diversion to get public attention away from his failures and misdirection’s over the past two years so that he can get reelected again, is he? The liberal media sure sung that Bush song with gusto. Looks like its time for another Obama world-wide apology and self- deprecation tour. Just remember; Obama was supposed to be the smart one giving us hope and change we can depend upon! For all our sake; there just has to be a better choice in 2012! 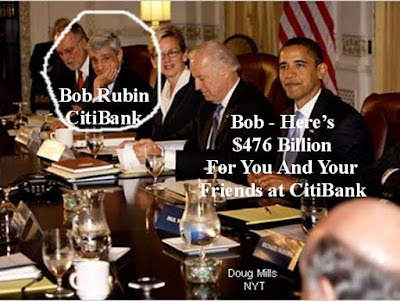 Obama pumped $476 BILLION of YOUR tax dollars into CitiBank. A key player, and therefore a beneficiary at CitiBank is Bob Rubin. You remember Bob, he was Bill Clinton’s Treasury Secretary. This is the new and improved Presidency, fortified with jive and heifer-dust! What a pathetic chapter in American history. A new, nonpartisan analysis of President Obama's proposed 10-year budget revealed Friday that the administration underestimated future deficits by more than $2 trillion. How can anyone take Obama's financial stewardship seriously? Miami Mayor Alvarez was recalled Tuesday for his tax and spend policies. Voters mad at Democrats? No! Guess Again! Alvarez is a Republican! He is a Rockefeller-Javits tax & spend Republican that doesn’t understand today’s issues. 88% of the quarter million voters validated what the national voters did last November. Bad news for Obama and his Senate Democrat fellow-travelers who also don’t get it. Taxpayers are financially stressed in their own lives and have had to make major reductions in their own budgets and way of life and will no longer tolerate government officials refusing to reduce public spending and hold the line on or reduce taxes. The major liberal media are still supporting their tax-borrow-spend friends and continue on with their reality-avoidance syndrome hoping that somehow things will change and their Prince and his Court will be saved. Obama has refused to acknowledge the results of his own deficit reduction task force and he continues to ignore the OMB estimate of over $100 Billion in waste and fraud. Instead of addressing the catastrophic $1.4 TRILLION budget deficit and the $14.5 TRILLION debt Obama and friends continue to fight Congress’s modest and measly $60 Billion reduction for this year ( that’s 0.060 Trillion or a 4% reduction in this year’s deficit)! If Obama and friends shut-down the Government over a paltry $60 Billion budget reduction it will seal their political fate just as Mayor Alvarez and hundreds of Congressmen learned last November. This hard-hitting film validates the many education items covered in this blog over the past 5 years. Roanoke Times: Mar 14, 2011; The state spends less per-pupil on education than Mississippi, leaving localities to pick up the tab for quality schools. Every State has their own unique division of responsibility and funding between the State and local governments and school boards. The more centralized the funding and control at the State level, the less control and management options there are at the local level. Which of course highlights the issue of why there is any Department of Education at the Federal level at all? Certainly the founders viewed public education as state responsibilities and limited the Federal government to establishment of the Land Grant Colleges as a “jump-start” for state development of college level agricultural education. $11,000 per year for K-12 results in each high school graduate receiving $143,000 of tax-payer supported public education. It is clear from comparisons of school results and performance that money is not the primary issue in why our schools are not performing as well as needed in our current world competition. 1. Parent-student indifference and or hostility to the teaching-learning process. 2. School administrator’s reluctance or inability to manage bad student behavior. 3. Teacher skills and knowledge and motivation for their assigned classes. 4. Over reliance on technology at the expense of mastering fundamentals. In too many school districts unions and courts have directed the hiring and assignment of unqualified or unsuited teachers with little or no management flexibility to hire or fire or even reassign under-performers. In many cases our teacher’s colleges are so focused on “feel-good and politically correct” courses that the core subjects are not mastered. New teacher qualification in Virginia no longer requires math mastery for non-math teachers yet every course and our culture demand at least 8th grade math mastery. And stop using calculators until every student can add one-forth plus five-eights! The liberal media have had unlimited opportunities to highlight and focus attention on the real educational issues, however, they continue their pattern of supporting broken systems and demanding that all will be OK if we just raise taxes to increase funding. Their misdirected focus adds to our educational issues. They could be part of the solution, but instead they choose to be part of the problem. Whose Working Rights Are They Anyway? The liberal media is awash with sympathy for the government unions in Wisconsin and their irresponsible “hide in the bushes” Democrat State Senators. Their allegations of denial of civil rights with no mention of the gross and uncivil actions of the unions and their bussed-in thugs highlights their practice of slant and bias. Everyone should have a fair chance for an available job based on skill and knowledge and willingness and ability to do the job. So why is joining a union a condition of employment? And why is paying union dues to a union even if you don’t join a union a condition of employment? Why do employers, including the government, deduct union dues from your paycheck and send your money to a union you don’t belong to, or don’t want to belong to (without your consent or approval)? So whose civil rights are being trashed, and by whom? Right to Work States do not allow these types of abuses of workers rights! If you qualify and are chosen for the job – union membership and payment of dues is your choice. Government officials and bureaucrats cannot be trusted to be agents for the taxpayers to negotiate with unions. They have no incentives to incur the wrath of organized labor. The result: give them whatever they want and just raise the tax rates. And guess which states are billions of dollars in debt, with staggering taxes and with businesses moving out? The pay, benefits and retirement packages of most unionized government workers is far beyond the private sector and far beyond the value-add of the employees. It’s way past due that someone stands-up for reason and reality. Virginia is a shining example of a “Right to Work State” and we all are beneficiaries of that sound and prudent policy. Roanoke Times, 3-9-11, Pg 8: RT Editor to join watchdog group. One might be optimistic about the opportunity for change to a more moderate and centrist and fair and balanced persona at the editorial board of the Roanoke Times, however, given the track record of those who are the “choosers” exuberant optimism should be tempered. For over 5 years and 1300 published items this blog is a testament to the deep rooted liberal and left-wing bias and slant of the Roanoke Times in both it’s editorial content and it’s selection of “news” from their fellow travelers. It’s as if they are totally unaware of News Corp (one of the largest news organization in the country) or other outlets of a contrarian view to theirs that they might embrace from time to time. The departing editor lamented that some of his detractors confuse his opinion with his integrity. Perhaps that is true. If one has a major role in influencing public opinion through a “news” venue and that person has a ongoing and continuous track record of supporting left-wing, liberal and Democrat views at the expense of all other views, but at the same time insists that they are fair and balanced; perhaps the line between opinion and integrity does get blurred! And whose fault would that be? The editorial change at the RT will probably be similar to the change of a unit of the French Foreign Legion in the Sahara Desert for 6 months. The Sergeant announces the good news: today we get a change of underwear! Antonine you change with Arnaud; Bertrand you change with Claude; Emile you change with Etienne! The search for new editors should be very easy. NPR has made three of their people available: Vivian Schiller, Ron Schiller and Ellen Weiss. These three have demonstrated the sad state of slant and bias of not only NPR but of our current batch of biased and slanted journalists masquerading as real journalists. Physician heal thyself! Perhaps all our liberal so called journalists should be required to take a course focused on Tim Russert who was a professional first; a Democrat second! Roanoke Times, 3-8-11, Pg 6: Gas prices are about more than just oil. 1. Obama’s energy policy to restrict and restrain domestic energy supplies. 2. Obama’s energy policy to require corn (ethanol) to be burned in our cars. These policies are totally unnecessary self-inflicted wounds to our people and economy and result in higher prices for everything that is grown, manufactured or moved; and that includes everything we use or consume. The Obama energy policy increases our dependency on our enemies and the radical revolutionaries in the middle-east and increases every aspect of energy cost through reduced supply and burning our corn instead of making food from it. No nuclear plants, no coal plants or production, no oil exploration or production; all this while we increase our population by 2.5 million people per year (that’s two cities the size of Boston)! This is like watching a dairy farmer increase his profits by weaning his cows off feed and hay. Works for a week! And to think – Obama was supposed to be the smart choice! Not in 150 years, since 1861, have the States of the United States been in such a state of open rebellion with the Federal Government! The ObamaNation has filled the government with socialists and “progressives” who are carrying out Obama’s vision of an all knowing, all controlling Federal Central Committee type of government not unlike that in Russia and China 50 years ago. This is being implemented with massive vote buying programs of government dependency and associated pandemics of entitlement programs all being supported by the leftist and fellow travelling major media. This has caused State governments, both Democrat and Republican, to rise up within public and legal venues to bring the 14th Amendment back to the intent of the founders and their intended balance of responsibility and authority. Health Care: 26 States are now partners in the legal move to declare ObamaCare Unconstitutional. Obama’s recent meeting with the States granting them permission to adjust ObamaCare to fit their requirements as long as they don’t make any changes to the program was yet another highlight of Obama’s gross arrogance. Multiple states have enacted strong Illegal-Immigration laws to try to help protect their citizens against the gross acts of Federal malfeasance in not enforcing the laws. Multiple States have enacted laws dealing with homosexual marriage as a gross departure from the very definition of “marriage” while Obama refuses to enforce the existing Federal law “Defense of Marriage Act” in direct conflict with his oath of office and who has now exposed our service personnel to something called “homosexuals serving openly” whatever that means. Multiple States are challenging in court the new Obama-EPA initiative to control CO2 as a major pollutant that we breathe out and plants breathe in with no clear definition of the value of these draconian restrictions on our people and industry. Multiple states are in direct confrontation with the Federal Interior Dept on the management of Western Gray Wolves that are no longer “endangered” but are causing major damage to livestock with no means of management or control. Multiple states are challenging the Obama-EPA rules for the Chesapeake Bay as being arbitrary and capricious and lacking a defined outcome resulting from these costly and restrictive and intrusive rules. Multiple states are in court to challenge the new Obama Coal Mining restrictions for the most important industrial and utility power generation in the country. Multiple states are in court challenging the Obama “hold” on Oil Drilling on and off-shore that is placing our economy at the mercy of our enemies and the chaotic mobs of armed revolutionaries attacking their governments across north Africa and the middle-east. Multiple states are challenging the unconscionable wages and benefits and retirement benefits that government unions have extracted from public officials who have totally ignored their responsibilities to the “taxpayers” who are now saddled with enormous burdens of debt and obligations totally out of line with private industry. The people of most of the states have spawned TeaParty groups to make visible and public what the left-wing media have refused to expose; the gross power grab of the Federal government and its malfeasance to spend, tax and borrow our people into a state of bankruptcy. Not since 1861 have the States of the United States been in such a state of open rebellion with the Federal Government! Vote for change in 2012! More US Soldiers Murdered and Obama’s Refusal to Say: “Radical Muslim Terrorist"
Frankfort Airport, a Radical Muslim Terrorist shot and killed two US Airmen and seriously wounded two more. One of them is in a life-support situation. And once again Obama could not bring himself to identify this as yet another "Radical Muslim Terrorist" attack. Apparently he cannot specifically condemn this class of murderers who belong to this Radical Muslim Brotherhood that he somehow and in some strange way has some connection to. This is the same behavior he demonstrated with the massacre at Fort Hood! There is something deep and dark within this psyche of denial and avoidance. Is he not the Commander-in-chief of our soldiers and should he not be a brother with them and not shirk from specifically condemning others who strive to kill them? No wonder over 30% of Americans think he’s Muslim! Being a member of the GodDamnAmerica Church didn’t help much either. Obama’s campaign slogan was correct: his change is not like the behavior of any US President in our history and hopefully after 2012 this behavior will never occur again! Cameron, Merkel, Sarkozy: Where’s Obama? For over 5 years The Roanoke Times has ignored the challenge to focus on sustainability in their business operations. Instead of responsible action they just continue their pattern of hypocrisy by pointing at “others” and ignoring their own behavior and actions. "I (Rupert Murdoch) am proud to announce that News Corporation has reached its first major sustainability milestone: We have become carbon neutral across all of our global operations and we are the first company of our kind to do so," Murdoch wrote in a memo sent to News Corp. employees. "We made a bold commitment in 2007 to embed the values of energy efficiency and environmental sustainability into all of our businesses -- for the benefit of our communities and our bottom line." Why isn’t this story in the Roanoke Times? Because News Corp. is the Wall Street Journal and FOX News among their other entities! Will this challenge change the Roanoke Times’ behavior? Of course not! They will continue on like the spoiled child who constantly points to others in a desperate attempt to divert attention away from their own pathetic behavior. One might note that Mr. Murdoch’s objectives were: “doing the right thing and enhancing the business bottom line: and NOT the Gore-AGW bogus-hysteria. Thank You: Mr Murdoch and your team of responsible citizens!